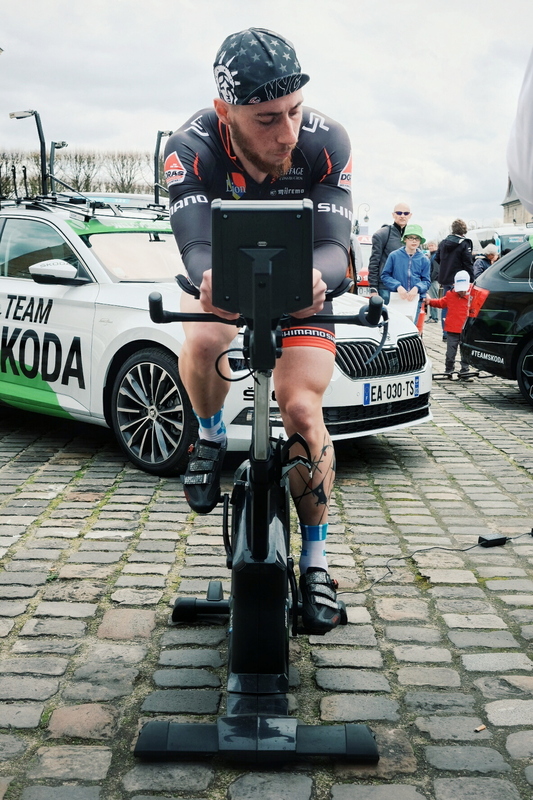 How the heck did I end up in Paris with two former French Pro cyclists and 19 more passionate amateurs contending to enter Team ŠKODA…? If we go really really way back, we could say that my Kindergarten years and my always riding everywhere would be the beginning… But this isn't an autobiography so, fast forward to July 2015, in the middle of the Tour de France, I finally got myself my long desired road bike. Some of you may know that my return to the cycling World was with my 1st ever Saint James Pilgrimage, crossing Spain with my 30 something kg bike and bags to get home and live a life-changing journey; you can read all the 15 days over here. With the aim of going further and higher in my cycling goals, after long hours of internet scouting, and the Tour de France making me eager to get a new bike asap, I found one 3rd hand Cannondale Carbon bike which wasn't used more than 2000 km by its previous owners and was in mint condition, what a deal! What else could I ask, well, Serge, the seller (and with coincidentally the same last name as my mother…) was quitting road cycling due to a health condition, so he also sold me his completely new cycling shoes and threw in two free jersey and bib-shorts: what a way to start my road cycling adventure! 330 kms in one day? I didn't take long to surpass the previous owners kilometric milestones and with just two big rides almost hit a quarter of that. Following goal after goal, my work commutes started to be mostly just on my bike and weekends opened up opportunities of travel and discovery never imagined, like a Col de Turini ride topping 180 km on my Strava (GPS tracking app), to just a week after hitting my still record ride of 330 km from Nice to Hyères (south-east part of Southern France) and back in one single journey; yes, some suffering and lots of food involved and, straight 11 hours sleep. Another even more ambitious goal was attempted, but technical circumstances postponed it for a future momento… don’t be impatient, it will it will, you will know in time. Committed to make it my main transport method, today I ride to work 20 km each way, surpassing already the 3k mark for this year, and close to the 10k for my still very young Cannondale. You truly know you love to ride, when you hit days of non-riding and feel that something is missing… or like Remi from Café du Cycliste said: you’re screwed mate, you’ve been bitten by the road bike bug! True that, and loving it! So without delaying more the initial question, on the final weekend of the Paris-Nice Pro cycling race, which I talked about here in another blog entry, I went for a pint and chill after one of my best cycling weekends up to that moment. Discovering a contest in CyclingHeroes.com via ŠKODA, I typed in the requested info an Bio and didn’t think much about it. Some kms had to be ridden via the Strava app, where my daily commutes did fulfill the needs more than enough. ... and boy, this was just the appetizer! If things were to go well, one week later we would have to meet at the famous Paris-Roubaix start. On Monday we would have the results and logistics would have to be deployed or not. No news on that day, so I simply started to think on some alternative weekend ride and was glad to have a nice chat with one of the Pros… But, next day an email came in: Congratulations! I had made it into the last 20 and had to start booking my tickets with destination: Paris! Unbelievable! I didn’t really sleep much that week and during half of it my head was looking forward to one unique weekend. This, bringing our bikes and ourselves, the hotel where to go, and the time we had to meet was all the info we were revealed. Having to work the day of travel, Friday was a late arrival for me, building up my bike, and some late dinner available at the reception’s microwave… Intrigue, jitters and excitement mixed up with some vague attempts of self control… eventually, sleepiness took over. Day 1 hit the agenda and as well as during my Saint James Bike Pilgrimage, I praised myself to get one fulfilling breakfast to jumpstart the ‘race’ for a spot in the first ever Skoda Cycling Team. 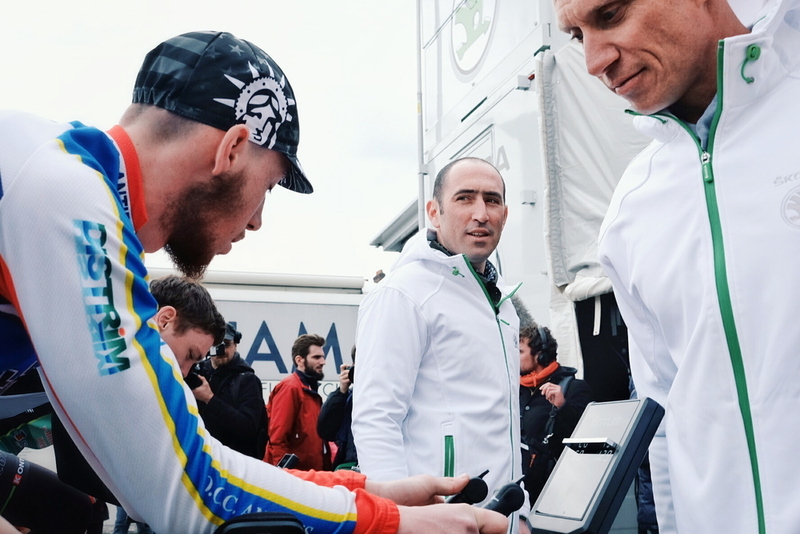 Talking about team, my first acquaintance was Mikael and we started talking about what might expect us, our cycling marks and he also graciously lend me the key to unscrew my pedals, which ended up being the only thing we would need that day. Seeing young Antoine overhearing us, I invited him over so we could meet as well. This started to look very promising already! However, as exciting and glamorous this day was being presented, we weren't asked to put on our cycling garments just for the looks. The more challenge relevant task was to assess our power and put the base for further improvement if we were to join the final 10. First, home trainer sessions of 2 min gaps with max bpm (heart-beats per minute) -30, then -20 and -10, to end up in a very intense 10 secs at full speed. Never having done this, I don't really know if my data is worthy or not, however, for the data addicts among you there you go: my max bpm is around 193, at -10 got almost 400W and at the 10s sprint got it up to 720 with max bpm only at 185. We concluded this first long journey with one delicious buffet dinner back at the hotel and some nice mingling with the rest of the contenders was on the table. The best about it? The great camaraderie atmosphere and passion for the same sport, without the competitive mode that could be expected, was among all of us and it rather seemed to be a gathering of cycling friends coming back from a long day ride and share the same table with one big smile each... we were at that moment, the Skoda family! That’s all for now, with episode 1 already available, you will have to wait until episode 2 to discover who will be part of the #TeamSkoda and hit the #RoadToMorzine! If you wish to see what this all looked like and take the opportunity to revamp your French, then watch the video below and stay tuned for our 2nd and very exciting day! Louis Caput... when a name says it all! Paris-Nice Challenge: riding like a Pro!